SOFSEM (SOFtware SEMinar) is the annual international winter conference devoted to the theory and practice of computer science. Its aim is to present the latest developments in research for professionals from academia and industry, working in leading areas of computer science. 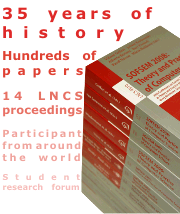 Proceedings containing the invited and contributed papers will be published in the series Lecture Notes in Computer Science by Springer Verlag. The SOFSEM program consists of Invited Talks by prominent researchers, Contributed Talks selected by the Program Committee from submitted papers, Poster Session and the Student Research Forum. SOFSEM is organized in plenary and parallel tracks, giving a unique opportunity to obtain an excellent overview of the selected research areas. All tracks are devoted to original research and leading developments. By tradition, one track of SOFSEM is devoted to Foundations of Computer Science. SOFSEM 2010 offers in addition three, outstanding tracks: Principles of Software Construction, Data, Knowledge and Intelligent Systems, and Web Science. SOFSEM is the ideal conference for discussions, for establishing personal contacts with colleagues, and for exchanging ideas. At SOFSEM 2010 all participants and lectures will be accommodated in the Bedřichov Hotel, Špindlerův Mlýn (Czech Republic) – an attractive winter resort town. SOFSEM is well-known for its familiar and inspiring atmosphere and especially suited for young computer scientists. See you at SOFSEM 2010!